Lucie recently brought in her machine to be serviced and we are so happy that she sent in a picture of the first project completed on the serviced machine. 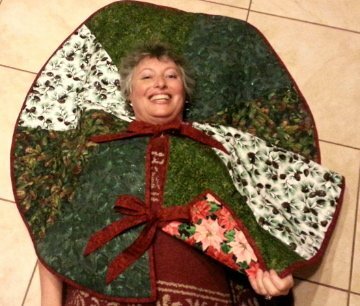 "Attached is a picture of the Christmas tree skirt I quilted for my new daughter-in-law. The poinsetta backing fabric was from the stash left by my late mother-in-law, top fabric was purchased while in LA for Christmas. Thank you for your help!"